The floating docks and San Juan del Sur bay and town as background. | Photographer: Róger Solórzano Sr.
More efficient infrastructures available for cruises and smaller craft passengers. 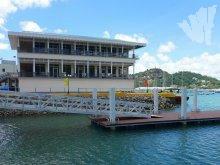 San Juan del Sur port made a quality leap in passengers reception services by installing floating docks. These docks can receive up to 4 tender vessel simultaneously, said Cesar Guadamuz, manager of that marine terminal. The floating platforms provides additional safety to passenger, and avoid delays due to the tide. The metal structures has safe handrails, a stable floating system, and a concrete base on land. Disembarking in San Juan del Sur will take half the time during next cruise season, compared to last years. For that reason, visitors will be allowed to enjoy more time in town, or in Granada colonial city, or Ometepe Island Biosphere Reserve. The new facilities could be also used by smaller vessel coming from near beaches with tourists looking to relish San Juan del Sur town and bay. This place has a enormous touristic activity now-a-days, and was part of the transit route on middle 19th century, during the gold rush in the United State. The Empresa Portuaria Nacional (Nicaraguan port enterprise), public entity who manage 5 tourist-oriented port throughout the country, invested for the new port condition 3.5 million dollars granted by the Inter-American Development Bank, IADB. 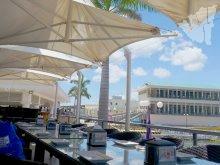 Right in front of the disembarkation area are located restaurants Royal Ocean and Añejos. Both culinary establishment offer state-of-the-art facilities, and high-quality gastronomy including a wide seafood menu served by people with real fishing experience. San Juan del Sur received more than 30 thousand cruise passenger during last cruise seasons, according to EPN’s record. They visited several South Pacific attraction coming from that port, which together with Corinto is a cruise visitors gate to Nicaragua.